Wolfgang Amadeus Mozart, the most astonishing child prodigy in the history of music, is felt by many people to be the greatest composer who ever lived. Dominated and shaped by a highly intelligent but frustrated and ambitious father, his story sees the development of a unique genius, from precocious and often endearing childhood to liberated fulfillment, unexpected poverty, and a tragically early death. 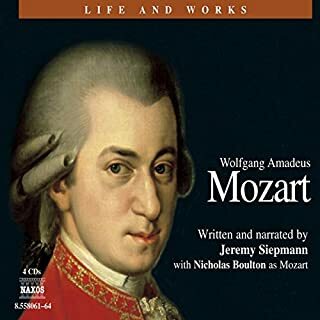 Generously illustrated by Mozart’s music, from his fifth to his final year, this portrait-in-sound reveals a fascinating yet elusive character, drawing richly on the words of the composer himself and those who knew him. For many people, Beethoven is the greatest composer who ever lived. In this portrait-in-sound, actors’ readings combine with his music to reveal a titanic personality, both vulnerable and belligerent, comic and tragic, and above all heroic, as he comes to grips with perhaps the greatest disability a musician can suffer. No man’s music is more universal; few men’s lives are more inspiring. In every sense but one - his modest height - he was a giant. 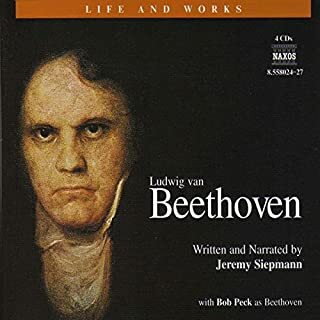 The great bonus of this audio-biography is that the development of Beethoven’s music can be heard in the context of his life. 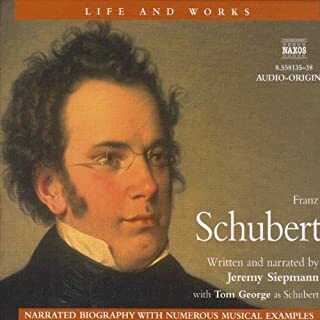 The life of Franz Schubert has been a gift to romantically inclined biographers: the beautiful, brilliant, modest boy who sprang to fully fledged genius at the age of sixteen; the quintessential ‘artist in a garret’, entirely consumed by his art and living a hand-to-mouth existence in Vienna (home of Mozart, Haydn and Beethoven); the gentle, cheerful, convivial young man who prized friendship almost as highly as music itself; the unworldly poet from whom great music poured like water from a fountain; the unrecognized master who died almost penniless at the age of 31. 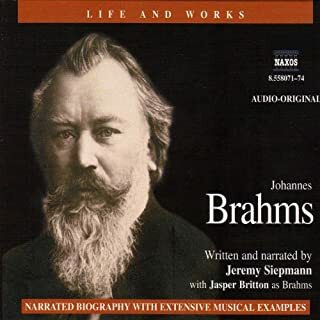 Brahms is one of the best loved yet most controversial of all the Romantics. Almost uniquely, his works have never suffered the slightest period of eclipse. Profoundly emotional yet governed by an iron discipline, the music, like the man, is a fascinating, entertaining, often deeply moving blend of opposites. He had a gift for friendship and a capacity for love far beyond the ordinary, yet no man could be ruder or more hurtful. 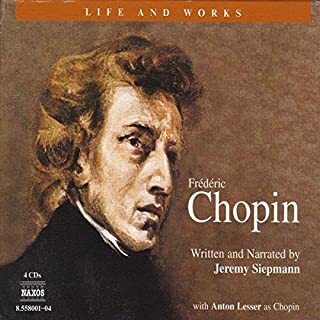 Frédéric Chopin is the pianist-composer par excellence. Regarded as one of the most mesmerizing performers of his day, he lives on in his music – his waltzes, mazurkas, études, preludes, nocturnes, three piano sonatas, two piano concertos, and much more. Here, his life, from his birth in Poland, his famous affair with the French writer George Sand, to his death at the age of 39 in Paris, is told with his music featuring prominently. We think of Chopin as a "frail, sheltered genius" but this forthright portrait demonstrates he was far more boisterous than that. 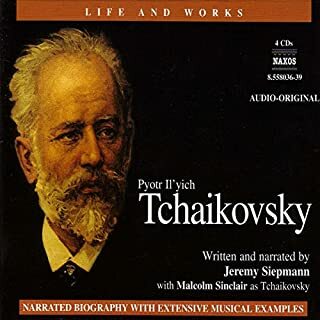 Tchaikovsky is one of the most popular composers of all time. His melodies are known to many people who may never have heard his name. They crop up on mobile telephones, alarm clocks and answering machines as often as on records and concert programs. Like his music, the man himself was widely loved, but his inner life was fraught with sufferings, confusions and a deep vein of self-doubt. The drama of his emotional life is vividly reflected in his music, letters and diaries, all of which play a major part in this intimate portrait-in-sound. With the possible exception of Mozart, Verdi is the most popular opera composer who ever lived. Quite early in his career his tunes were being cranked out by barrel organs throughout Europe and were well known to many who may never even have heard his name. But the complex man behind them remains elusive and puzzling. In this portrait-in-sound, Jeremy Siepmann and a group of distinguished actors take an in-depth look behind the popular image of a man who was, and perhaps remains, the most enduring national hero in Italian history and a colossus in the history of music itself. No great composer’s story is more predominantly happy than Haydn’s, though even his has its share of clouds. A classic rags-to-riches tale, it sees him move from humble beginnings through decades as a liveried servant to his emergence as the most popular and successful composer of his time. One of the healthiest and least neurotic artists in musical history, he did more than any other single figure to pioneer the symphony, the piano sonata and the string quartet - and he was the first truly great practitioner of each. Although now beloved and revered by millions as the greatest composer who ever lived, Johann Sebastian Bach (1685–1750) was best known in his lifetime as an organist, and was eclipsed in fame as a composer by two of his twenty children. For the last twenty-seven years of his life he was a schoolteacher and choir director whose duties extended to meal supervision and dormitory inspection. Yet throughout his career he composed a vast body of music which is amongst the most joyful, dancing and enrapturing ever written. Jazz is a uniquely American art form, one of America's great contributions to not only musical culture, but world culture, with each generation of musicians applying new levels of creativity that take the music in unexpected directions that defy definition, category, and stagnation. Now you can learn the basics and history of this intoxicating genre in an eight-lecture series that is as free-flowing and original as the art form itself. Wagner’s Ring cycle is the most ambitious work in the history of music: four operas that combine to tell a single epic story. Based in legend, it has become a legend in its own right: a supreme challenge for conductors, singers, opera producers, and indeed for audiences. But for all its grandeur and complexity, The Ring is far more accessible than many music lovers think. Author and narrator Jeremy Siepmann leads a large, talented cast through this behind-the-scenes biography of the popular classical music composer. The perfectly chosen narrators play their parts with professionalism and subtlety in the extraordinary drama of the great man's life. Siepmann lets his authoritative voice and knowledge of the subject lead listeners through the inspiring rags-to-riches story. Most enlightening are the letters between Dvorak and his contemporaries as the narrators portray them. Secrets are revealed with heightened emphasis and portentous pauses, letting listeners feel the rhythm of the conversations. One of the best-loved composers of all time, Dvorák rose from rural origins to become not only a great but an influential composer. The first composer to put his native Bohemia on the musical map of the world, he was invited to do the same for America. One result was the famous "New World" Symphony, which made him a household name across the globe. Writing music of irresistible color, lilt and peasant vitality, he was also a melodist-in-a-million. This portrait-in-sound follows a lovable and in many ways a very simple, man from hay cart to imperial palace, from tragic loss to heart-warming joy, to pigeon-raising and world celebrity. I love the format, mixing the text with music. I would have been happy with twice or three times as much of each, and would have preferred more depth. I found the narration over the top; the emotion, the cultured accents, were overdone. At times it felt like a Monty Python sketch. 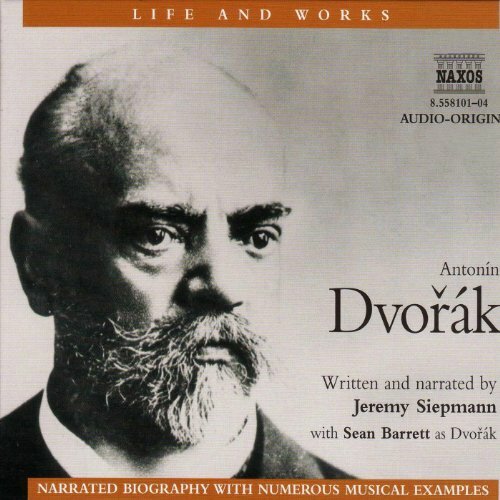 But if you're looking for the basics of Dvorak's life and a taste of his music, it's a good choice. This is the second book I've listened to from this series, and while the music is lovely, the author never really gets into any significant analysis of the composer's character or his compositional methods. I guess I've been spoiled by Robert Greenberg, who does both. This is a lightly researched look at Dvorak, a composer who deserves so much more. It's probably meant to serve as an introduction only, but if you are a classical music enthusiast, I'm afraid it won't tell you much that you don't already know. Everything good! Fascinating quotes, thoughtful narration, fine cast with good voices, lovely music. I didn't want it to end.